Our pets can’t tell us exactly what’s wrong when they don’t feel well, so Mariposa Veterinary Wellness Center offers in-house advanced diagnostic services for nearly all animal species. We are proud to extend our services to cats, dogs, small mammals, exotics and avian pets. Onsite diagnostics allow us to detect and diagnose ailments quickly and accurately. With these technologies, our team is able to identify the cause, rule out issues and make educated decisions about condition management and treatment. With a variety of diagnostics at our fingertips, Mariposa’s Fear Free certified team members provide compassionate, quality medical care when it’s needed the most. A complete medical assessment for your pet begins with a thorough physical examination during which their eyes, ears, skin, cardiovascular, neurological, gastrointestinal and skeletal systems are examined for any abnormalities. Vomiting, diarrhea, weight loss, pain, swelling, and loss of appetite are all clinical signs that may require further diagnostic tests to identify the cause of your pet’s condition. We work in partnership with the industry leader in diagnostic innovation, IDEXX, to provide exclusive IDEXX tests and consultations from board-certified veterinary specialists and pathologists as necessary. Blood work and clinical chemistry workups can help to assess the proper functioning of your pet’s organ functions. These include the kidneys, liver, pancreas and endocrine system, which entails both the thyroid gland and the adrenal glands. These tests can allow for the prompt diagnosis of conditions which affect the major organs, and they can also facilitate the diagnosis of conditions like diabetes. Blood analysis is critical when monitoring disease and infection. Radiography (x-ray) is routinely used to provide valuable information about what’s going on inside of your pet’s body. We use x-rays to evaluate bone fractures, the gastrointestinal tract (stomach, intestines, colon), the respiratory tract (lungs), the heart and the genitourinary system (bladder, prostate). X-rays are often our best resources for locating tumors, stones, orthopedic issues and swallowed objects. We routinely utilize board-certified radiologists from Tallgrass Veterinary Imaging to review our radiographs and to provide additional expert insight. Cytology is a branch of pathology which is frequently used in the diagnosis of abnormalities, malignancies and disease. We perform cytology by collecting bodily fluid and aspirated material, and then thoroughly examining the cells and cell structures under a microscope. A biopsy is a piece of abnormal skin or tissue which is surgically collected from your pet. When a biopsy is obtained, it is submitted to a qualified pathologist for interpretation. These results aid in the diagnosis and treatment of their condition. Stool samples can detect the presence of various parasites or eggs of parasites. Analysis of urine samples is a method which is used to detect types of urinary tract diseases or infection. Through a urinalysis, our team can evaluate and measure valuable information such as protein, glucose, and blood cells, which may indicate injury, disease, or defects. 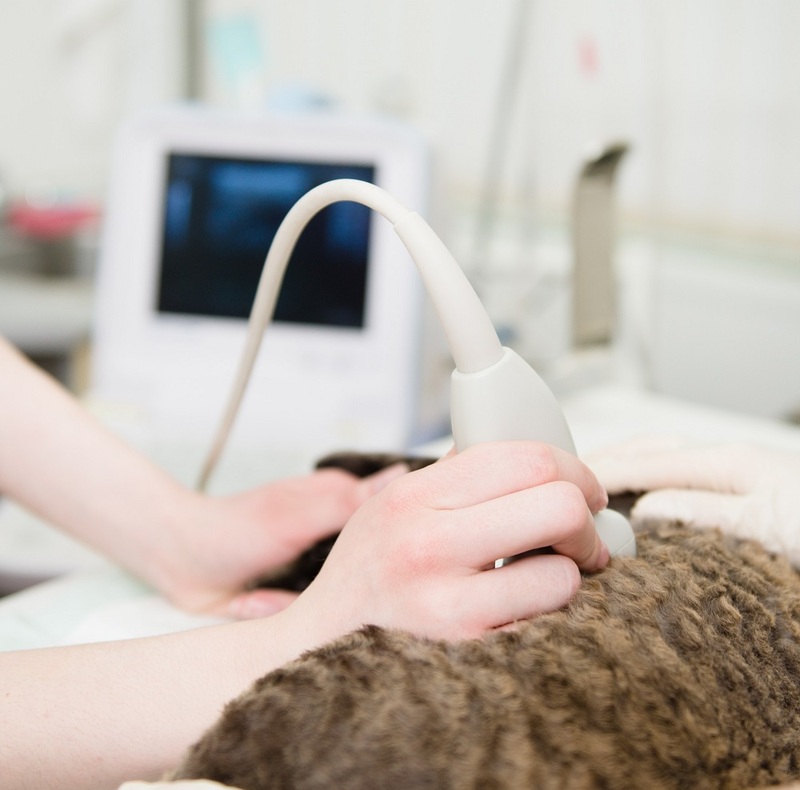 Ultrasound is a non-invasive way to evaluate the internal organs of your pet. These images provide a three-dimensional view of the liver, kidneys, spleen, bladder, intestines, and more. Ultrasound enables us to perform tissue aspirates and biopsies from abnormal areas within the body without surgery. In many cases, this process is invaluable in obtaining a definitive diagnosis for your pet. Ultrasound examination is also helpful in evaluating ferrets for adrenal gland disease, detecting liver lobe torsion in rabbits, and identifying follicular stasis in bearded dragons. In fact, we are one of the few veterinary facilities in the Kansas City area which is able to perform ultrasound exams for your exotic pet. Cystocentesis is the process of using a small gauge needle to obtain a sample of urine for analysis. A cystocentesis allows our team to keep the sample sterile. The procedure prevents the sample from becoming contaminated with bacteria, cells, and other debris from the lower urogenital tract. This quick procedure can be performed with ultrasound imaging guidance.